There are some albums that are truly unreal. 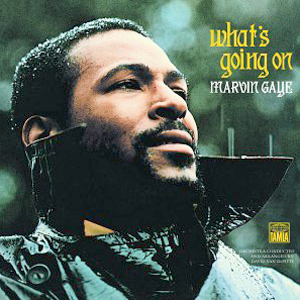 For many, Marvin Gaye and his What's Going On album are truly flawless and to a lot of us, it's his best. Now, for me, I have a different opinion on his best album, but this album is truly monumental. There aren't many albums in history with as much impact as this one. So today, we gathered the team for a discussion on this album. Some kept it shorter, others went into more detail. Let's get into it. It's a Tuesday, the morning of December 25th. Christmas. The year is 1990. I'm 5 years old. I wake up to the smell of bacon, eggs, grits and wrapping paper. My sister is already up and my mom and dad are talking around the record player and the song that's playing is "Flyin High". A song I've heard before at this point, but it's a little more special today. Maybe its Christmas. Maybe its because I like the music of that lightskinned dude who is always singing with that chick. Here's what I do know. My mom loved Marvin Gaye, my dad loved Marvin Gaye, and I loved Marvin Gaye. At that age, I don't think I fully understood what an album was or how they worked. But I knew a lot of the songs I liked were on that record with this man looking off into the yonder. What I had no clue of was how this album would be heralded as one of the greatest pieces of musical composition in the history of soul. The album was "What's Going On". I loved how the album flowed together. One minute you are feeling the rhythmic sensations of calm drums and next you are grooving to the piano waved intro of Mercy Mercy Me. I didn't know what "soul" was at the time, but I know it was something you only got from music that speaks to you before you even before you know the meaning of the feeling it gave. Rarely does an artist put out a timeless song. Even more rare does an artist put out timeless albums. Once in a lifetime does an artist specialize in making timeless music. Marvin Gaye did that. What's Going On is a masterpiece. What's Going On, as many of you know, isn't my favorite Marvin album. But, is it a classic? Yeah...hell yeah, it's a classic. It's Marvin Gaye we're talking about. Just about everything he touches turns to classic. And this album is no exception. Hell, just looking at the track list and you've got enough here to make your own "greatest hits" album. From start to finish, it's a great CD. Don't punish me with brutality..."
Is it 1971 or 2015? Marvin Gaye recorded "What's Going On" and it's just as applicable today as it was then. His lyrics were a cry for help in my eyes. At the time, Gaye targeted the Vietnam War and drug abuse. Today, we're still at war with the powers that be. While the song possesses a soulful sound, its message cannot be ignored. On the heels of 9/11, the song was covered by artists of various genres. History often repeats itself and music reminds us of that daily. If Marvin were here, I can only imagine how disappointed he'd be that conditions haven't really changed. His words ring true - only love can conquer hate. I believe that with my whole heart. Mr. Gaye, we have to ask again... What's going on? Before I begin, I just want to say that Marvin Gaye is essentially my all time favorite artist period. Because of that, I've made a semi effort to not cover his music so much on the site and this might actually be my first time writing about him officially, since Speed did the one on Here My Dear a while ago. There is no one in the world who makes music that I feel in my soul like Marvin. His voice speaks directly to the things going on in my life and I just instantly vibe with each song he sings. I could listen to all his albums regularly in succession, but this album was so special. It spoke to the sign of the times, along with truly expressing a black man's plight in the 70’s and it still feels relevant today. Who could imagine that an album over 44 years old could still be relevant and the music still sounds fresh. That is what the true definition of a classic and timeless music is. From the opening sound of the title track to the smooth and soulful sound of "What's Happening Brother", all the way to the desperation seemingly sung in "Save the Children", the sense of urgency to fix the world, ourselves, and the surroundings really captures your mind and soul. I'm still partial to Mercy Mercy Me, as the riffs, the soulful instrumentation and the all around greatness of the song period truly hits me every time. Marvin took his time and made something that has a long lasting legacy and the impact of this album will truly never die to me. This is hands down, one of the greatest albums of all time.